Tomas Kavaliauskas: During the early stages of the Catalan independence movement, the countries of eastern central Europe were conspicuously silent about the issue. After the declaration of independence, however, they sided with Spain. It seems that those countries which in 1989 demonstrated the power of the powerless are now afraid to speak out against Madrid’s authoritarian approach to Catalonia’s aspirations towards independence. Has the spirit of 1989 evaporated? Jordi Arrufat: First of all, we respect the decisions taken by the governments of any sovereign nation with regard to Catalonia. To answer your question: no, I don’t think that the spirit of 1989 has evaporated. The Baltic governments, especially the Lithuanian government, are very active and committed to supporting both Ukraine and Georgia. Both countries have been subject to severe aggression by a third country and are in a very delicate situation. Having said that, we are fully aware that, being Catalonia in south-western Europe, we can hardly expect to be a priority for governments from the Baltic area and Visegrad, especially if we take into account the instability caused by Russia in those regions. We understand that, right now, security is the top priority for the Baltic States and Poland, and we see it as normal that Spain is helping the Baltic States as part of Nato. However, I would like to highlight that it took six months for Spain to decide to join Nato operations in the region, while other smaller nations were there from day one. I would like to invite Lithuanian, Latvian, Estonian and Polish public opinion to think about Spain’s sudden interest in being there, while at the same time supplying Russian vessels on their way to Syria at the port at Ceuta – not part of Nato, true, but a Spanish port nonetheless. Although we have received no institutional support from the Baltics and Visegrad, there have been some individual demonstrations of support in the media. Notable here are Kestutis Girnius and Otto Ozols in Lithuania and Latvia respectively. Both focus on the same line, ‘Spain cannot be compared to the USSR, but we all remember what it was like when the West called us separatists and radicals and we felt like no one was coming to help us from outside’. Carme Arenas: While I couldn’t say if the revolutionary spirit of the countries of the former Soviet orbit has been lost, the policies of the governments of some of these countries may certainly make us think so. We miss all that energy against totalitarianism that once existed. Their refugee policies, for example, are not policies in favour of freedom and humanitarian values. We are aware that the Catalan issue has been silenced at the state level, due to Spain’s efforts to conceal the problem. Catalonia did not appear in European news until very recently, although the crisis has been a long time coming. Although we have received support from private actors, for example some PEN centres, official or government support has been timid. There have been more signs of friendship and understanding by MPs and parliaments than by governments. There have been parliamentary motions, or parliamentary support groups in Denmark, Switzerland and the Baltic States: these were the first to say something about the issue. 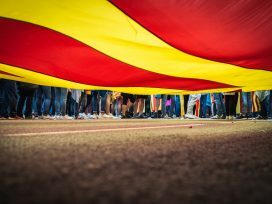 Tomas Kavaliauskas: In Lithuania and other Baltic states, fear of separatism prevents political institutions from expressing solidarity with Catalonia. The worry is that Russia may encourage Russian-speaking populations to claim independence. However, Russia operates a geopolitics of separatism by military means, as in Ossetia and Abkhazia in 2008 and in Crimea in 2014. More importantly, perhaps, the word separatism has negative connotations. In 1990, the Baltic States were separatists in positive sense, legitimately claiming their independence. Similarly, I think Catalan separatism can claim to be positive, in the sense that independence is being sought by peaceful means, just like Solidarnosc in Poland or Sąjūdis in Lithuania. However, some argue that the comparison is false, since the Soviet Union was a dictatorship, whereas Spain is a democratic country. How would you reply to this? 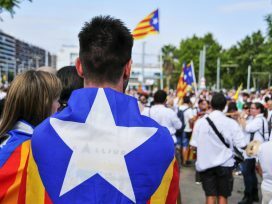 Jordi Arrufat: Obviously, Catalonia cannot be compared either with what happened in Georgia or Ukraine. In the case of Catalonia, we are talking about the right to self-determination of an old European nation, where support for independence swings from between 40 per cent to 55 per cent, according to different polls. Calls for a proper independence referendum swings from between 70 per cent to 80 per cent of the population. In the Georgian and Ukrainian cases, where the demand for self-determination is low, this is a clear case of disrespect for the principle of territorial integrity. There have been voices in the Baltic States saying that because Assange is supporting Catalonia on Twitter, Catalonia is being supported by Russia. Nonsense! No one in Catalonia asked for Russian help and no one is expecting any ‘little green men’ to come and help us with our peaceful self-determination movement. The cases cannot be compared. In any case, this article prevails over article 1, which says that Spain is a democratic country. Many jurists argue that there is scope in the Spanish constitution to organize a proper self-determination referendum in Catalonia. However, the two main Spanish political parties and their politically-appointed members of the Spanish Constitutional Court have kidnapped the constitution. So, we have a situation in which a problem that should be solved politically is being managed by courts distrusted by the Catalan population. These are the same courts that dispatched the Spanish police when we went to vote on 1 October, leading to scenes that should never have happened in a democratic Europe. This only stokes arguments about Europe’s hypocrisy, something anyone worried about the future of Europe should think about. Carme Arenas: The terms ‘separatism’ and ‘nationalism’ can have very different meanings in different countries and cultures. Catalan nationalism has nothing to do with that of the Lega Nord in Italy, for example. I agree that separatism is a word with negative connotations and that it should be avoided. In fact, it is only used by those who reject Catalan independence. Separatism for them means lack of solidarity and a refusal to acknowledge the other’s culture. The independence issue is clearer without these connotations. As to whether Spain is a democratic State, I would say it is a formally democratic but not a consolidated democracy. Sociological Francoism, still so present, shows it, as does the passivity with which the government reacts to fascist intolerance. Statements by ministers or senior representatives of the Partido Popular are out of place in a democracy: for example, a prominent representative of the PP has talked about illegalizing parties that defend the independence of Catalonia. Illegalizing ideas in 2017! The fact that they do not recognize that Catalonia can decide its future is evidence of their democratic shortcomings. Tomas Kavaliauskas: Sometimes, antagonistic politics towards a neighbouring country does not coincide with cultural preferences. For instance, a Lithuanian or Latvian might be anti-Russian in the sense of opposing the aggressive politics of Putin’s government, but might certainly admire Russian culture and the Russian language. The Catalan independence movement is opposed to the politics of Madrid, but what about Catalonia’s cultural ties with Spain? 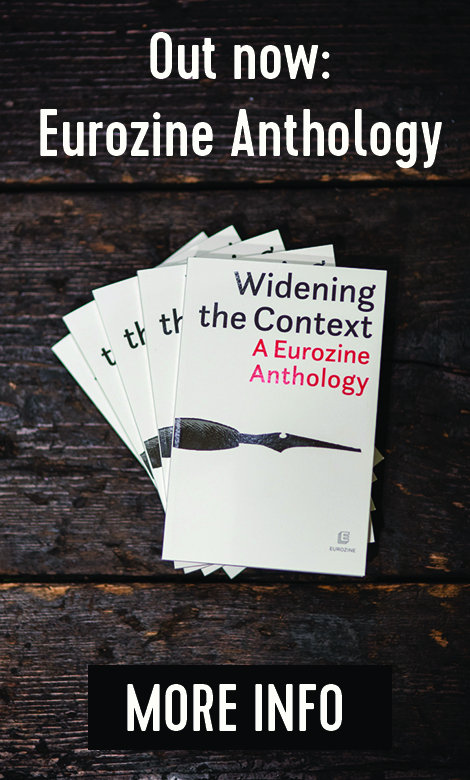 Is there a clear line between Catalan and Spanish culture, including literature, language and traditions? Jordi Arrufat: No, there is no clear line. For example, one of the best Catalan writers today, Albert Sánchez Piñol, has written a novel on the conquest of Barcelona by the Bourbon army in 1714 – in Spanish! In Catalonia, there is absolutely no hatred or phobia towards the Spanish language and Spanish culture. What the Catalan independence movement seeks to do in cultural terms is to make sure that the Catalan language is well protected. This is something Madrid has never really cared about and no one else will do if not the Catalans themselves. Carme Arenas: Catalonia does not want to renounce Spanish culture. We don’t want to lose this richness: everyone who loves literature, for example, will continue to read and admire their favourite Spanish writers. And the people of Catalonia as a whole won’t renounce Spanish culture either: it is a culture that a large part of the Catalan population feels as its own, and no one will be asked to feel otherwise. In Catalonia there have always been many writers in the Spanish language, some of them great: nobody thinks they should stop being part of our culture. It is true, however, is that Catalans are disappointed with Spanish intellectuals, the vast majority of whom have failed to express a position with respect to Catalonia that is different from official discourse. I insist on that, because it is important: there is a feeling of great disappointment in this respect. Tomas Kavaliauskas: It is often said that if Catalonia separates from Spain, then the Basques will follow suit. And so on. The fear is of divided European countries. But should we not acknowledge the moral and even the ontological right for each nation to be sovereign? What, then, is the moral argument for independence? The issue is often reduced to the economic level, but what about historic background, historic roots and legacies? Jordi Arrufat: At present the Basques are looking at Catalonia, that is true, and it will be up to the Basques to decide what they want to do. It would be hypocritical for me to say that Catalonia has the right to self-determination and not the Basques. In any case, in the Europe of the single market and open borders, this shouldn’t be a concern. Whoever has fears for the unity of their country should look at what London did and not Belgrade, which is the model for Spain right now. It has often been said that Catalan independence is all about the economy. I can hardly agree: both the Catalan and Spanish economies are already doing quite well, and demands for Catalan self-determination still exist. 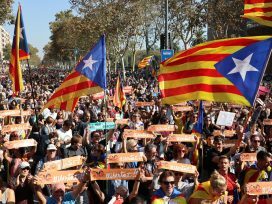 The real push for independence is because the Catalans have realized that Spain is no longer capable of accommodating the plurinational reality within the constitutional framework. 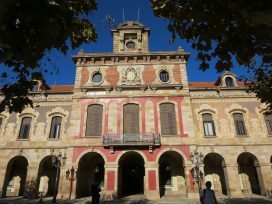 In 2010, the Constitutional Court rewrote fourteen articles of Catalonia’s Statute of Autonomy and reinterpreted twenty-seven others, mainly relating to language, justice and fiscal policy. It also deleted the reference to Catalonia as a ‘nation’. Demands for self-determination were very low until then. So, yes, Catalans are very attached not only to their language, but also to their historical institutions. The Government of Catalonia, the Generalitat, was created in 1359. Our current President, Carles Puigdemont, is the 130th President of the Catalan Government. The current Spanish Constitution was only ratified in 1978. When you hear the arguments in Madrid, it sometimes seems that even the Big Bang took place in 1978. Carme Arenas: There are very different reasons for independence. There are economic reasons, of course: Catalonia is part of a state that economically mistreats her, in terms of taxation and investment and infrastructure. But the current desire for independence doesn’t have solely economic reasons. There are also historical and cultural reasons. Especially important is the existence of our own language, which we feel is constantly under threat from the Spanish authorities. Our nationalism is not as romantic as it was in nation states of the nineteenth century, especially large ones. The right to decide is the expression of a secular, republican civic will. It is republican because it is guided by the values of freedom and equality. The Catalan citizenry (or a very important part of it) thinks that Spain is no longer the appropriate framework if we want to build this new country. Tomas Kavaliauskas: Has the International PEN Centre made any resolution to support Catalan independence? 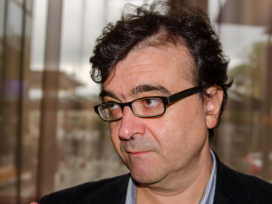 Jordi Arrufat: There is a manifesto signed by many prominent international cultural figures defending Catalonia’s right to vote on its political future, among them 5 Nobel Prize laureates.1 In three countries, university professors and researchers have signed a manifesto either condemning the Spanish crackdown on 20 September (the UK2) or defending Catalonia’s right to decide its political future (Portugal3 and Slovenia4). In Slovenia, the signatories include some of the fathers of their own declaration of independence. Slovenia is a country which feels very attached to the cause of Catalan self-determination. Carme Arenas: The Writers for Peace Committee of PEN International approved a statement, and the International Congress of PEN International has passed a resolution asking the Spanish State to respect the European Charter of Human Rights. These two texts show the position of PEN International and show the concern of the organization about the issue. PEN International does not interfere with the policies of the governments, but it does position itself and works to denounce governments that do not respect human rights. The Spanish government has violated human rights. This goes not only for the police violence on the day of the referendum, but has also during the previous weeks, when rights were violated that are of particular concern for International PEN, such as freedom of expression: the closing of web pages, police raids against newspapers and magazines. This interview was held in early October 2017, before the Catalan declaration of independence on 27 October 2017. The Public Diplomacy Council of Catalonia (DIPLOCAT) was closed by the Spanish Government on 28 October.